Desperate Housewives: The Game for Android/iOS (iPhone/iPad). 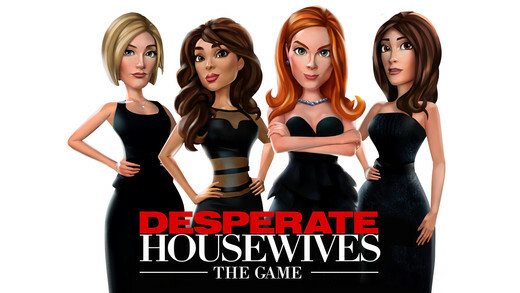 Desperate Housewives: The Game Tip #1: Characters. Once you reach the Central Park District, you will gain access to the character finder! You can use the character finder in the upper left hand corner to locate the character whose portrait is showing. Keep cycling through the characters, who will appear in alphabetical order, to get to the character you need. You can also locate a character that you need by selecting the objective that you need them for! To unlock a character, tap on them to see what they need. You will be able to earn necessary items by performing actions with other characters, placing buildings, and various other goals. Each character is different! Select the bubble you need and you will be taken directly to where you can complete the objective! When you've received enough items for the character, tap on the checkmark above their head to turn in the item. You can also unlock characters instantly by hitting the instant unlock button. Desperate Housewives: The Game Tip #2: Inventory & Items. You can access your inventory through Deco Mode. Enter Deco Mode by selecting the four arrows in the lower left hand corner. Once there, you can select the inventory icon in the bottom right hand corner. Select the items you want to place and click on the checkmark to confirm their placement! You earn items to unlock characters by having specific characters perform actions, or by collecting from buildings. Items can be common, uncommon, rare, extra rare, or epic. As rarity goes up, the item will be less likely to drop. Keep trying! Desperate Housewives: The Game Tip #3: Quests. Begin a quest by selecting the “!” above a character’s head! You can see all of your current quests on the left side of your screen. Complete a quest by finishing all of the necessary objectives! Press the forward arrow next to each objective to be taken to where you can complete it. Quests list all actions that have a chance of yielding the items you need to complete them. Some items are rarer than others so performing the actions will not always drop them. If you complete the action and the item doesn't drop, just try again! Desperate Housewives: The Game Tip #4: Daily Events. There is a different event for every day of the week. From Monday to Friday they are the Trials of the Elements and for Saturday and Sunday there are the Treasure Chambers. The Treasure Chambers award coins (Saturday) and diamonds (Sunday). The Daily Event can only be completed once per day. Each event has a tier, initially tier one (1). Higher tiers offer higher rewards. If you fail to complete a tier, you can replay it or fall back for a easier tier. Should you complete the highest available tier (initially tier 1) of the Daily Event, next week a new, more difficult tier will be available. Desperate Housewives: The Game Tip #5: Performing Actions. Tap on a character to see all of their available actions. To start an action, first tap on the character, then click “Go.” Possible drops for an action will be listed to the right of the action.